Must Watch: Hugh Jackman Goes Mad in the movie, "The Wolverine"
On a scale of one to ten claws, how excited are you to watch the movie, The Wolverine? Are you excited? Throw your claws up in the air if you are! 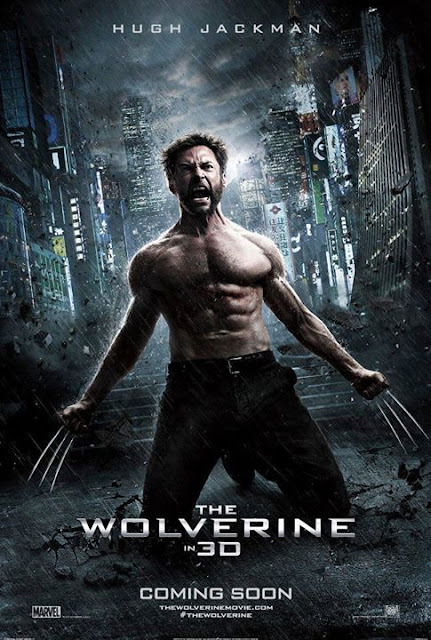 Have you seen the trailer of The Wolverine? Well, here it is... watch the full trailer in all its glory! After watching the full trailer, I'm quite sure it's going to be epic and I can vouch for its awesomeness. It just made me way too excited to watch it on the big screen. Wolverine was summoned by a mysterious man he saved in the past, who claims that he can make him mortal. With claws that look as dangerous as ever but from the looks of it, it seems like Wolvie might be losing his mutant powers ... the healing factor and regenerative power (Uh-oh!) I would guess that his healing factor is weakened but I don't think Wolverine has lost his powers entirely. Oh, and there's a cameo! Looks like Famke Janssen would reprise her role as Jean Grey from the previous “X-Men” movies. Or is it just a flashback? It's hard to tell from a trailer so let's just wait and see. Watch out for Silver Samurai, Wolvie's fiercest enemy to date. It gets my curiosity piqued even more to see this movie once it opens in theaters on July 25. I guess everyone's excited to see this movie. Having said that, PMCM Events Management invites you to another blocked screening of "The Wolverine" on July 25, 9 pm at Robinsons Galleria. 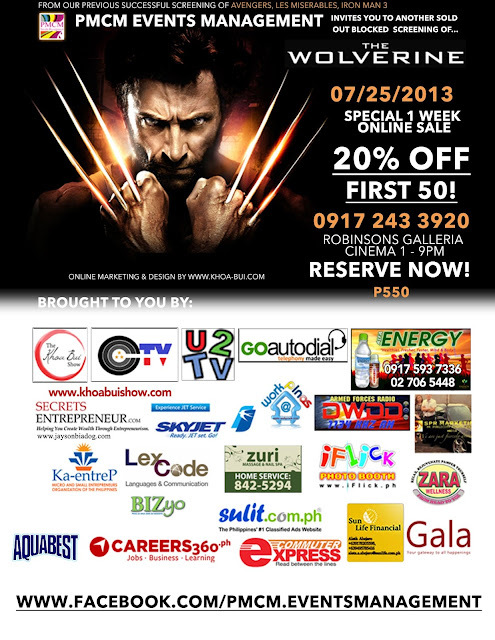 Ticket price is PhP550 but make sure to buy tickets until June 30 to get 20% discount! Ticket comes with Popcorn and drink plus giveaways from sponsors! How cool is that? Cool movie! I wanna watch it too! Based on your words, you made me want to jump out of bed and drove the nearest mall and watch. he's my favorite X-Men character!